A lushly illustrated, fanciful adaptation of a Turkish folktale tells the story of a poor villager named Mustafo, who must give a gift of tribute to his tyrannical Mongol ruler. When he presents his old donkey, which is all he has, his ruler is furious and threatens him with death. But Nasreddin Hoca, the wiseman, assures the cruel ruler that this donkey is no ordinary beast, and he will soon teach it to read. 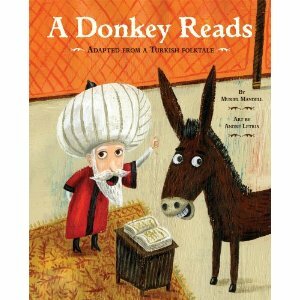 Will his clever plan save Mustafo, outwit their ruler, and show the world that this special donkey really can read? A Junior Library Guild Selection. As it says in the description above, this story is an old Turkish folktale which starts out with..."Once, many years ago, a small village in Anatolia inhabited by the Seljuks was conquered by the Mongols." But as the book goes on, the reader is drawn in more and more, keeping pace with the worry, astonishment, cleverness, and humor of the story. The illustrations are well drawn and visually appealing, which gives the readers something to look forward to. I have to say I felt very sorry for the family who had to give away their donkey. And the donkey - the poor animal was going to be given away to a horrible leader who was forcing the poor to give away their most prized possessions. The plot and vocabulary (wrath, indignity, humble, tyrant, boasted, etc) are something I would want to share with upper elementary. Since the book is in all sense pretty sad, and even though it has some humor to it (the donkey learning how to "read") I would not share this book with younger children. It talks about children being hungry, people being beaten, and a very sad way to live life (in fear of a government official). I would recommend this book for those wanting to learn more about Turkish folktales, and hardships that people must overcome. Even though there was a little bit of humor (the fact that the donkey is "reading" where he turns the pages, and "brayed" outloud), I didn't really enjoy the ending where it says "...we don't know whether Nasreddin escaped the threatened beating." It also doesn't really teach a lesson of any kind. I just don't see myself reading this book to my family, nor would I want to. If you are interested in buying this book, please click on the title link above which will take you to Amazon's product page.